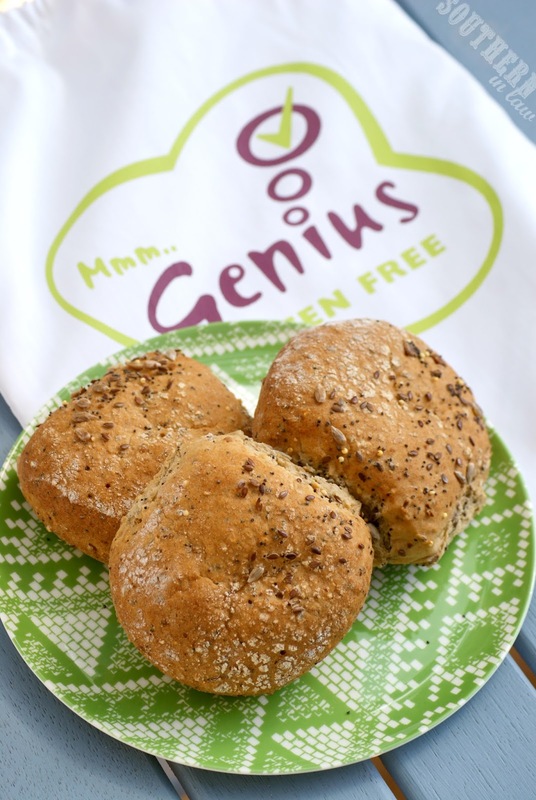 Southern In Law: Genius Gluten Free Bread - I'm in Love! Genius Gluten Free Bread - I'm in Love! When you eat a gluten free diet, good gluten free bread is incredibly important. Actually, it's vital - it stops your sandwich from going soggy as you cry into your lunch box. I'm not kidding - when I first found out I was a coeliac, I cried over bread many many times. Gluten free bread has a bad reputation - it's often claggy, brick-like, tasteless, cardboard like, crumbly, dry, or just plain disgusting. Genius Gluten Free Bread, on the other hand, is absolutely freaking delicious. I kid you not - it's the best gluten free bread I've tried. Ridiculously, deliciously, good - and you know I don't make these claims lightly! They're available in the Gluten Free Freezer section of Coles stores right around Australia. So far, I've only tried the Seeded Rolls but I am now on a mission to try ALL THE THINGS - so stay tuned for what I think of those. The Genius Gluten Free Range in Australia includes (according to the website) Croissants (!!!!! ), Brown Bread, White Bread, Pains au Chocolat (Chocolate filled pastries), White Bloomer Loaf, Spicy Fruit Loaf, Triple Seeded Sandwich Bread, Pizza Bases and Short Crust Pastry. Um, where do I sign up for an unlimited supply?!?! Yum! Yesterday we had an insanely busy day, so I packed up my lunch to eat on the run - a Cheese, Mighty Mite and Salad Roll (don't cringe, it's a delicious combination!) and I gobbled down my roll in the car on our way to our next appointment. Don't worry, Mama SIL was driving, but I told her one thousand and sixty one times that it was the most delicious bread ever - and after one bite, I knew I had to instagram it ASAP. So much good, soooooo so much good. In fact, I'll be having the same lunch today because it was that good. But tell my, what's your favourite sandwich filling? I love my Vegemite Cheese and Salad Combination or Avocado Cheese and Salad - but for a sweet lunch, I love a PB&J with Blueberry Jam! 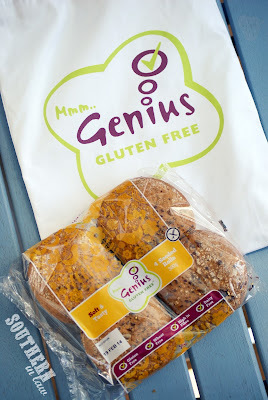 Kristy received Genius Bread for this review, however, as always - all opinions are her own and she has not been influenced by the company in any way. We have Genius bread here in the states but nothing else from the line. Those bread rolls look lovely! Hopefully they make their way to the states. As for favorite sandwich filling...I love my two top favorites either roasted red pepper hummus or sunflower seed butter and apple butter! They are absolutely delicious so here's hoping! Both of those sandwich combinations sound amazing! I need to try and make some apple butter as I can't seem to find any here!